In March of 1634, only 26 years after the pioneering exploration by Captain John Smith, colonists arrived at St. Clement's Island, about 25 miles upriver from the mouth of the Potomac. They moved to a site on the St. Mary's River (about 17 miles back down the Potomac), where they established a colony. The settlers were led by Leonard Calvert, who became the first governor of the Maryland colony. 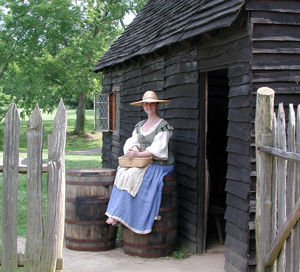 The settlers were only the first of many to come to the Potomac region in the early 17th century. In Virginia, settlers arrived at Coan Creek, about 15 miles upstream from the mouth of the Potomac in Northumberland County in 1648. The Lower Potomac section of Virginia, known as the Northern Neck, developed its own culture, separated by the wide Potomac from the Maryland colonists, and from other Virginia settlements by considerable distance. The Maryland settlers arrived at St. Mary's on March 27, 1634. They immediately began constructing homes, meeting with the natives (who showed them how to hunt, fish, and gather oysters). Instead of searching for gold, as many settlers did, the St. Mary's inhabitants got on with the business of building a colony. The early city was laid out as a closely knit country village. Family groups brought supplies and tools from England. A survey aided with the selection of home sites. Since they arrived early in the season, they could plant crops for fall harvest the first year. St. Mary's City today is a small town with a growing public college, St. Mary's College. The State of Maryland has developed a museum highlighting archaeological sites, called Historic St. Mary's City. This 800-acre living history museum is a National Historic Landmark. Exhibit areas at the museum include a Visitor Center complex that contains an Archaeology Exhibit Hall and museum gift shop in addition to its orientation facilities. The Godiah Spray Tobacco Plantation is a living history farm of the 1660s, complete with livestock and crops. The Governor's Field exhibit area houses the reconstructed State House; the square-rigged ship the Maryland Dove; Farthing's Ordinary, a re-created 17th-century inn; and several archaeological sites of structures relating to the 17th-century capital. Several other important archaeological sites are found within the boundaries of the museum, including the St. Mary's Chapel Field, the site of the first English Catholic Church in the Americas. A re-created Woodland Indian longhouse focuses on the interaction and cooperation between native Americans and European settlers. A walking trail system connects the exhibit areas. Interpretation at Historic St. Mary's City features costumed living history demonstrations and participatory activities, historic vignettes, and walking tours. During the archaeological field season, guided tours of the digs are offered. The museum has an active school tour program, including hands-on activities and living history outreach. Special events include Maryland Days in March, a Grand Militia Muster, Tidewater Archaeology Weekend, and Harvest Home. Public programming offers lectures, traditional music concerts, and outdoor theater. Historic St. Mary's City is part of the "Find Your Chesapeake" project of the National Park Service and the Chesapeake Conservancy. Click here for details. Historic St. Mary's City is a site on the Southern Maryland Religious Freedom Byway, a route of historic sites dealing with the establishment of religious freedom in the U.S.